Karachi, October, 16, 2012: Trivia20, a successful online campaign carried out by Jubilee Life in sync with T20 World Cup 2012, has been recently concluded after receiving an exceptional response from cricket lovers all over the nation. Hundreds of people participated in the competition to win exciting prizes such as Inzamam ul Haq and Mushtaq Ahmed autographed bats and various electronic gadgets. The competition was conducted online through social media platform Facebook, where it provided a chance to the network users to answer interesting cricket related questions to win prizes. The purpose behind the launch of Trivia20 was to add more fun and excitement to the T20 World Cup for the cricket admirers. Understanding the ever increasing use of social media, Jubilee Life has been exceptionally active on this platform. The company has taken its digital presence to a new level through active engagement of users by organizing contests such as Trivia20 and many other fun applications. The digital media platform enables it to interact with young audience and potential customers effectively and success of the Trivia20 is a testament to that as over 56000 fans have registered themselves on the page so far. Jubilee Insurance is a global brand of Aga Khan Fund for Economic Development (AKFED) that offers diverse insurance solutions (life, health and general) in the Asian and East African Markets. Jubilee Life in Pakistan offers uniquely designed range of Life Style plans for every customer’s need. These include retirement, child education, marriage, saving & protection, wealth accumulation, women plan and rural insurance solutions. Karachi, September 20, 2012: House Building Finance Company Limited (HBFCL), the country’s leading housing finance institution has taken strong notice of misleading and inaccurate reporting in a section of the press, regarding the appointment and continuing in office of its regularly appointed MD and CEO, Azhar Abbas Jaffri. HBFCL has pointed out that as recently as September 10, 2012 it received a letter from the Finance Division, requesting the presence of Azhar Jaffri for a meeting of the PAC in Islamabad. The said letter is categorically addressed to Azhar Jaffri as ‘Managing Director HBFCL’, and hence reports in the media referring to some letters in the past from the Finance Division, and purporting to indicate that the Finance Division does not recognize Azhar Jaffri as the MD, are categorically inaccurate and malicious. HBFCL wishes to further clarify that in the past 3 years, it has sent number of letters to the Finance Ministry, requesting the reconstitution of the HBFCL Board. Moreover in various communications to the Ministry, the issue of the appointment of the MD has also been raised by HBFCL and the present MD himself. As an example, HBFCL would like to draw attention to the letter of the Company Secretary dated January 10, 2012 sent to the Ministry, in which it was clearly pointed out that the 3 years term of appointment of the MD expired on January 05, 2012 and the Ministry was requested to advise as soon as possible in case the term of the incumbent MD/CEO is to be extended for a further term of 3 years by the HBFCL Board. In this letter the HBFCL also pointed out that the Ministry of Finance appointed Board of Directors in its meeting of September 21, 2011 had desired that the retiring CEO will continue to hold his office for purposes of avoiding any interruption in the business of the HBFCL. In this regard it is also to be noted that under Section 199(3) of the Companies Ordinance 1984, which is applicable to HBFCL, the retiring CEO shall continue to perform his functions until a new CEO is appointed. Regarding erroneous media reporting on the MD’s original appointment and relating to his nationality, HBFCL wishes to clarify that Azhar Jaffri had categorically declared his nationality in the Fit & Proper documentation of the State Bank of Pakistan, before he was approved for and subsequently appointed as MD HBFCL. Therefore to say that the Competent Authority was not aware of his nationality at the time of appointment is also a blatant misrepresentation of facts. Further, some misleading reporting about Azhar Jaffri having reached the age of superannuation is also based on incorrect information. Pursuant to the Vesting Order SRO.1/2007 dated July 25, 2007 issued by the Finance Division, GoP, HBFCL is no longer a statutory institution and is a company existing under the Companies Ordinance, 1984. Therefore, government rules of superannuation do not apply and retirement at the age of 60 is not mandatory or applicable. HBFCL sincerely hopes that with these clarifications, the sections of the media which have published speculative news reports on HBFCL and its management will henceforth desist from publishing erroneous reports that only serve to create confusion and malign the organization when it is one of the very few state organizations that has shown a financial turnaround and registered a profit for the past 2 consecutive years and also expected to show continued profits 2012. KARACHI, December 13, 2012 – Emirates, one of the fastest growing international airlines, provided an unforgettable experience for youngsters from the CARE Foundation by staging a coaching clinic with star players from National T20 champions Lahore Lions. The children were thrilled as Umar Akmal and Nasir Jamshed signed autographs and posed for pictures at the Gaddafi Stadium. They also had the opportunity to ask the Pakistan international players about their lives as professional cricketers. In addition, the youngsters bowled deliveries to their special guests and tried batting against them. “It is tremendously satisfying that through our sponsorship of domestic cricket in Pakistan we are able to stage events like this which inspire youngsters. We aim to extend our support by providing opportunities such as this to children who can benefit from meeting with these experienced, national cricketers,” said Khalid Bardan, Emirates’ Vice President, Pakistan. “Children look up to cricket players and hopefully this activity will not only help them develop their cricket skills, but also inspire them on a personal level,” added Bardan. “Interacting with these children and experiencing their excitement first hand is a gratifying feeling. Knowing that you may be able to make a difference to their lives is the reason I got involved with the sport in the first place,” said Akmal, star batsman of Lahore Lions. “Through this great initiative undertaken by Emirates we really enjoyed connecting with the children and were able to offer our advice on techniques as well as what a cricketing career entails. Their passion inspired us,” he added. A representative from the CARE Foundation – a non-profit organization dedicated to providing a better future to the children of Pakistan by empowering them through education – said the youngsters were delighted to meet the two cricketers. Emirates also recently arranged for 100 children from the CARE Foundation to witness the National T20 final. The airline treated the children to an exciting day as they watched their cricketing idols from the stands. The airline has a long history of supporting cricket through its various sponsorships across the globe. The National T20 was the latest tournament in Emirates’ collaboration with the Pakistan Cricket Board (PCB). Following this, the airline will also be supporting the upcoming Faysal Bank Super8 T20. Multan, March 04, 2013: Coca-Cola Beverages Pakistan Ltd. held a ground-breaking ceremony of its new Greenfield project in Multan. The ceremony was inaugurated by Senior Advisor of Chief Minister Punjab Zulfiqar Khosa, and attended by a huge gathering, including key government officials, media personnel, local dignitaries and Coca-Cola employees. The Greenfield project in Multan is one of the three Greenfield projects being set up in the country by Coca-Cola Pakistan. A total amount of $379million will be invested over the next three years, with the funds being utilized for expanding the business and bringing about infrastructure and systemic improvements in the Coca-Cola system. The energy efficient Multan plant will be fully equipped with state-of-the-art production equipment and product warehousing facility. Coca-Cola System provides directly & indirectly employs more than 8,000 people, while another 35,000 people are employed through its supply chain and another 100,000 benefit through employment in allied industries. The System has played a pivotal role in the promotion of Multan’s rich culture and heritage, huge investments have been made to restore historical landmarks especially the Multan History Museum and facilitated the Multan district government in renovation of Allamdar College, a great symbol of architecture and cultural heritage of Multan. In addition to that, CCBPL has invested Rs. 4 million towards setting up a food street at Qila Kohna Qasim Bagh. Furthermore, Coca-Cola has an extensive CSR Portfolio which focuses on education, environment and water stewardship and women empowerment. Karachi, June 20, 2013 – LG Electronics (LG), a global leader and technology innova-tor, has continued to push the barrier in consumer electronics with the launch of its flag-ship 2013 Smart models in Home Entertainment and Appliances at a grand event. At the heart of LG’s innovative new smart features include the 55-inch Cinema 3D Smart TV (55LA8600), the Linear Door-in-Door refrigerator and the 6 Motion™ Direct Drive washing machine. In combination with LG’s signature technologies, the new ap-pliances deliver energy, time and help enrich consumer’s lives. “Our Home Entertainment appliances are a testament to LG’s unmatched leadership in next-generation displays but also proof of our commitment to bringing to market the most exciting TV technology available today. Meanwhile, our Home Appliances enforce our commitment to introducing our new product line-up of refrigerators and washing machines that encompass state-of-the-art appliances designed to supplement consumer lives and enhance their comfort,” added Mr D. Y. Kim. LG’s flagship model, the 55LA8600, takes inspiration from the consumer to create the simplest and intuitive user experience possible. The Smart Control features allow users to easily access their favorite programs, premium and newsworthy content, and practical applications through the customizable Smart Home interface projected on the TV screen. The user can access the menu content with the aid of LG’s upgraded Magic Remote, which entails simple command options such as point, wheel, gesture, and speak. LG’s SmartShare technology allows users to browse and share files from external de-vices wirelessly on the LG Smart TV or watch TV on another smart device. New SmartShare features are Tag On, Time Machine II, and LG Cloud. The Tag On feature allows mutual content sharing and mirroring by simply “tagging” the smartphone to an NFC sticker provided with the TV. The LG 84LM9600 is the world’s first 84-inch Ultra HD 3D TV. At 84-inches, picture quality is taken to a whole new level with four times higher resolution than Full HD. LG continues to be at the forefront of industry innovation and it is the brand’s market leading technology developments, such as Triple XD Engine, that makes it possible to produce the breakthrough 84-inch Ultra HD TV. The TV also boasts LG’s latest features and functions, including its award-winning Smart TV and Cinema 3D technology. LG Resolution Upscaler Plus feature then allows standard or high definition images to be rendered in higher detail to ensure a better viewing experience no matter what you’re watching. LG’s Home Appliances have been driven by world class technology and innovation with the aim of providing ultimate comfort and functionality in a user’s home. LG’s In-verter Linear refrigerators are equipped with the smart Door-in-Door (DD) feature. Similar to the French Door-in-Door refrigerator, the new Side by Side Door-in-Door features a door panel that provides quick and easy access to the refrigerator at the push of a button, revealing a new enhanced space to store and organize food and beverages and help reduce waste. The panel is great for storing and easily accessing high frequency sought after items such as milk, condiments and dairy, which is great for those with hungry children that seem to stand in front of the refrigerator all day, or for making the most out of simple entertaining for family and friends. The Door-in-Door panel allows consumers to access items stored inside without affect-ing the temperature of the entire refrigerator. Hygiene Fresh is also added in these refri-gerators, which promotes proper air circulation inside to eliminate odor and bacteria as quick as 15 minutes. LG’s next-generation 6 Motion™ Direct Drive offers the biggest capacity for Front Load Top Load washing machine models in the market. Equipped with core technology, Inverter Direct Drive, the system increases the motor’s efficiency, thus making it less prone to breakdown. The simplified mechanism—no belt and pulley unlike in traditional motors—also helps reduce noise levels, and increase energy and cost efficiency. The 6 Motion™ Direct Drive, enables the drum to not only move in tumble motion but also adds stepping, filtration, rolling, scrubbing and swing. This feature offers perfect washing performance that delivers a complete and efficient washing solution just like a hand wash. The model comes with improved energy and water efficiency that more than offsets the demands of its heavier loads. Packed with top-grade features, the washing machine’s 6 Motion™ Direct Drive technology tailors it’s washing depending on particular fabric types, its True Stream provides an enhanced deep-clean performance and family care while THE SMART DIAGNOSIS provides stress-free assistance to keep the machine in perfect working order. The LG Direct Drive Motor with Optimum program enables the washer to operate in lower capacity and lesser water consumption. It detects how much laundry is loaded, and selects the optimum wash, rinse and water consumption based on the information. The Load Detection will save the consumer a bundle of time and money. 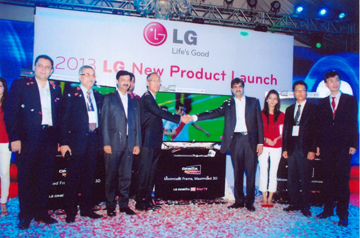 SEOUL/ Karachi, Sep. 23, 2013— LG Electronics (LG)announced that it has sold over-one million Door-in-Door™refrigerators worldwide since its introduction in 2010, a significant achievement in the home appliance industry. The company’s innovative double layered Door-in-Door™feature enhances consumer convenience, providing quick access to frequently used items while also helping to prevent cold air from escaping the main refrigerator compartment. LG’s Door-in-Door™ offers 65-liters of usable space, equivalent to an additional small single-door refrigerator .In LG’s side-by-side refrigerator models, the Door-in-Door™ feature not only gives users easy access, but also helps reduce cold air loss by 46 percent , contributing to lower electricity bills.The Door-in-Door™ provides a smart organization system that gives each member of the family their own storage space.The sealed compartment also provides maximum flexibility with easily adjustable shelving and Moving Baskets. LG Door-in-Door™ refrigerators are available in over 50 countries all over the world. The innovative Door-in-Door™ feature can be found in LG’s top-freezer, bottom-freezer, French-door and side-by-side refrigerator models. Karachi, December 31, 2013: The organising committee of the upcoming ‘Cities and Us’ Pakistan Urban Forum-South Asian Cities Conference 2014 confirmed the participation of Harvard University professor, Rahul Mehrotra today. The conference is scheduled to take place from 10th to 12th January 2014 in Karachi, with the inauguration ceremony to be held on 9th January. The mega event will bring together stakeholders from Pakistan itself, other South Asian countries and some Western countries also, in an effort to share experiences and learning relating to various issues and challenges pertaining to the development of South Asian cities. Participants will include relevant officials of government departments, architects and town planners, community-based organisations, urban activists, corporate leadership, academia and the citizenry. In a bid to involve the top urban development and planning experts from around the world, the organisers confirmed that Mehrotra will be a participant at the mega conference. Mehrotra is the Professor of Urban Design and Planning and Chair of the Department of Urban Planning and Design at Harvard University. The Indian is a practising architect, urban designer, and educator. His firm, RMA Architects, was founded in 1990 in Mumbai and has designed and executed projects for clients that include government and non-governmental agencies, corporate as well as private individuals and institutions. Other dignitaries from Harvard University, who will be speaking at the conference in Karachi include Satchit Balsari, Justin Stern, Meena Hewett, Ruth Barron, Jennifer Leaning and Spiro Pollais. Yawar Jilani, member of the conference’s organising committee, said that the involvement of officials from the Harvard University will add value and substance to the conference. Further representation from the US was announced as Andrew Himes, Executive Director of the Charter for Compassion also confirmed his participation. The author of The Sword of the Lord: The Roots of Fundamentalism in an American Family, Himes is also the founding editor of MacTech and later founded Project Alchemy which works for social justice in the Pacific Northwest. He is also the co-founder of the international movement, Poets Against the War and founded Voices Education Project. The four-day conference is being organised by the Planning and Development Department of the Government of Sindh, the South Asia Institute of Harvard University, Urban Unit, Government of Punjab and the Institute of Architects, Pakistan. The unique event is expected to get participation from other South Asian countries, and aims to be a dialogue process to discussing and finding innovative solutions to common challenges for urban development. Karachi, April 08, 2014: Peek Freans RIO, the market leader in the cream biscuit category of Pakistan, fully in line with its tagline Fun Ka Daily Dose, is bringing Hollywood’s mega-hit film Rio 2 to Pakistan. The film is set to premiere on April 11. Rio 2 is the sequel to Rio The Movie released in 2011,which was also brought to Pakistan by Peek Freans RIO. Rio 2 is a 3D computer-animated musical adventure-comedy that is expected to draw huge crowds. The title of the film refers to the Brazilian city of Rio de Janeiro, where the first film was set and where Rio 2 also begins. Peek Freans popular brand RIO was launched more than 15 years ago, and the name was inspired from the name of the city Rio de Janeiro; a city admired for its beauty which has been reflected in the shape and design of Peek Freans Rio biscuit shell. Rio 2 is produced by Blue Sky Studios and directed by Carlos Saldanha. While the film starts off in Rio de Janeiro, most of the plot then shifts to the Amazon rainforest. The film with Peek Freans RIO sponsorship will be released across 6 cities nationwide on April 11, the same day it is set to be released in the USA. English Biscuit Manufacturers (Private) Limited, the maker of Peek Freans biscuits, was established in 1967 as the first manufacturer of wholesome, hygienic packaged biscuits in Pakistan. For over 45 years, EBM has been a symbol of trust and confidence for consumers, making it the leading biscuit manufacturer of Pakistan. EBM is the first biscuit company in Pakistan to have achieved ISO 14001, ISO 9001 and HACCP certifications. The Peek Freans brand also enjoys the internationally acclaimed Superbrands status. Karachi/ DUBAI – July 02, 2014 - Emirates has introduced several initiatives to ensure the well-being and comfort of its customers observing the fast during the holy month of Ramadan. In keeping with traditions and values of this important religious occasion, Emirates has developed a special Iftar meal service. For flights departing close to Iftar, the meal eaten by Muslims to break their fast after sunset every day during Ramadan, Emirates will provide small snack boxes at the boarding gates of Emirates Terminal 3, while large Iftar meal boxes will be served to passengers in-flight. The large Iftar meal box, designed by Emirates’ chefs, will be served in Economy class, with a similar selection served to fasting passengers in both Business Class and First Class. Additionally, Emirates uses a unique tool to calculate the correct timings for Imsak (the time to commence fasting) and Iftar while in-flight. Emirates developed the tool, an industry-first, in conjunction with the Dubai Astronomy Group. The tool allows Emirates to calculate the exact Ramadan timings using the aircraft’s longitude, latitude and altitude; ensuring the greatest level of accuracy possible while onboard. For example, customers who are in-flight when the sun sets will be informed of the Iftar time by the captain. Iftar will be determined based on where the aircraft is located at the time the sun goes down. This new tool was developed to supplement Emirates’ annually produced booklet on the timings for Ramadan, available on every flight. Non-fasting passengers travelling on regular or Umrah flights to Madinah and Jeddah will receive a cold meal instead of the regular hot meal for all flights taking off after sunrise and before sunset, to respect the many Muslim passengers completing Umrah on these flights. During the holy month of Ramadan, Emirates’ award-winning ice system will feature special Arabic programming including two new big hits from Khaleejy – Kasr Khawater and Mahol as well as four box sets of the following: Loubat Al Mout, Share’ 90, Darb Al Zalag and Abu Al Malayeen. These are in addition to 26 channels of movies, 13 channels of TV programming and the popular classic plays, Qanas Khaytan and Forsan Al Monakh. Emirates would like to wish all our Muslim passengers Ramadan Kareem. Karachi, October 27, 2014: Ufone, one of Pakistan’s leading telecom operators, has over the years been introducing some exceptional offers specifically designed to reward the loyalty and support of its customers. Kismat Ki Dastak-2, introduced on 2nd June, 2014 is a continuation of the Kismat Ki Dastak-1 (KKD-1) campaign which was launchedback in 2010 and reintroduced again this year on its huge success and popular demand. It is an SMS based service in which prizes were given based on points and draws. Ms. Khalida Asif from Lahore won the first grand prize of this campaign, amounting Rs 25 lacs. Besides the grand prize there were 119 regular prize winners, whereas there was a prize of Rs 1 lac for daily top scorer and Rs 2 and Rs 10 lacs for winners via weekly and monthly draws respectively. 30 extra prizes including Smartphones, Led Tv, 70cc motorcycleetc were also given to frequent users via different campaigns.